Much like the wilderness itself, the Silver Trail history, which predates the Klondike Gold Rush, is untamed and still highly visible. Artifacts, buildings, equipment and monuments still dot the landscape. While efforts are being made to catalogue it, Silver Trail history is not yet confined to books and memories. Supplemented by tours of the history Binet House in Mayo and Mining Museum in Keno, travelers here will acquire a firsthand sense of that history. 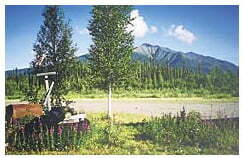 Equally accessible are the area’s recreation facilities and wilderness hikes. Travelers may readily drive to alpine meadows and hike panoramic ridge tops by Keno, travel magnificent historic waterways by canoe, explore old mine sites for unusual specimens, or fish the area’s water. The Silver Trail is a quiet, lightly developed region that will appeal to those who travel with a sense of adventure. While it was the search for gold along the bars of Stewart River in 1883 that first brought white men in any number to the region, it was the discovery and subsequent development of massive silver deposits that gave the area its name, character and stability. Before the arrival of fur traders and explorer, the Stewart had been used by the Northern Tutchone as part of their traditional area. First Nations people camped, hunted and trapped along the river they knew as the Na-Cho Nyäk, or Big River. More permanent settlements were established around the turn of the century at McQuestern, Lansing, and at Old Village near Mayo with the development of trading posts and towns at these locations. All these communities were abandoned by 1960, with most of the former inhabitants resettling in Mayo. Pictured here is Chief Johnson of the Mayo Band, later called the Nacho Nyäk Dun, 1920. In the 1880s, as many as 100 men a year worked the gravel bars of the Stewart. It came to be known as the “Grubstake River” because a man could always find enough gold there to cover his costs for a season. 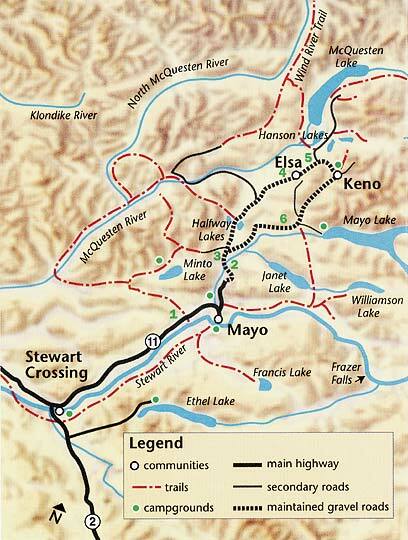 In 1903, the town of Mayo was established and the first silver claim was staked on Galena Creek, near present day Elsa. The property was not mined until 1913, when it was restaked as the Silver King. A silver staking rush ensued, leading to the discovery of the Roulette claim in 1919. 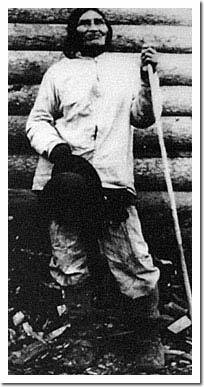 This claim, on Keno Hill, represented the most significant silver strike in the Yukon. During the 1920s, Keno Hill Mines, the town of Keno, and an ore processing mill were all established. Elsa was developed in 1935, after the mill was moved to process the rich Elsa claim. United Keno Hill Mines in Elsa played a major role in the Territory’s economy during the silver boom in the 1950s and became the second largest producer of silver in Canada–the fourth largest in the world. By the time the low prices forced its closure in 1989, total production from the Silver Trail region was over 213 million ounces of silver, 710 million pounds of lead, and 436 million pounds of zinc. 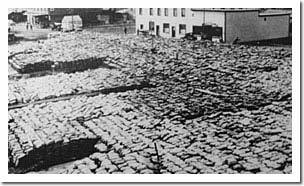 This photo shows 12,000 tons of silver-lead ore, sacked and awaiting shipment on Mayo’s waterfront in 1938. It would go by riverboat and barge to Whitehorse, and from there by train and freighter to smelters in the U.S.
Today, Elsa looks much the same as it did in its heyday, but is essentially uninhabited. Keno has a small group of residents who maintain the hotel and mining museum, Mayo remains the area’s main service centre, serving an active placer gold mining industry, mineral exploration companies, wilderness outfitters, and a growing tourist trade. You can tour and watch wildlife along our scenic roads. Or you can camp, boat or canoe/kayak on heritage rivers. Mountain bike or ride horseback on beautiful mountain trails through some of the continent’s wildest country. Fish, hunt, rock hound, or pan for gold on real goldbearing creeks. Tour museums and mines. Visit artists’ studios for locally-made arts and crafts. In winter, you can ski, skidoo, or kick back and watch the Northern Lights while staying at one of the cozy lodgings in the region. The Silver Trail’s scenery, flora and fauna is a photographer’s paradise. Don’t miss our guided river and air tours, as well as fly-in fishing and hunting. Our region is rich in First Nation culture and pioneer and mining history. The friendly people along your route will help you enjoy your stay in the land of the Nacho Nyak Dun First Nation people, pioneers such as Jack McQuesten and Al Mayo, and generations of silver and gold miners.